Meet Logan Pyle, a lapsed grad student and stay-at-home dad who’s holding it together by a thread. His father, Gus, has died; his wife, Julie, has grown distant; his four-year-old son has gone back to drinking from a bottle. When he finds Julie kissing another man on a pile of coats at a party, the thread snaps. Logan packs a bag, buckles his son into his car seat, and heads north with a 1930s Lousville Slugger in the back of his truck, a maxed-out credit card in his wallet, and revenge in his heart. After some bad decisions and worse luck, he lands at his father’s old A-frame cabin, where his father’s young widow, Bennie, now lives. She has every reason to turn Logan away, but when she doesn’t, she opens the door to unexpected redemption—for both of them. 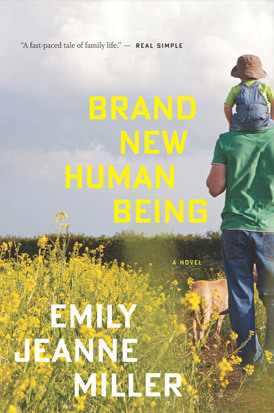 A deftly plotted exploration of marriage, family, and the road from child to parent, Brand New Human Being is a page-turning debut that overflows with heart and grace.